The Vantec USB External 7.1 Channel Audio Adapter is an amazing audio accessory for any computer or laptop. 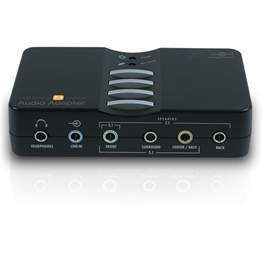 Simply connect this device to any USB port to enjoy true audio bliss with its amazing 7.1 channel audio technology. Sound will never be the same with full-duplex playback, giving you a cleaner and more dynamic sounding experience. Movies, music, and videos will sound surreal supporting 48/44.1 KHz sampling rates for not only playbacks but recordings too. Combining high quality audio recording and playback capability, the Vantec USB External 7.1 Channel Audio Adapter is the ideal for anyone looking to take their audio experience to the next level.